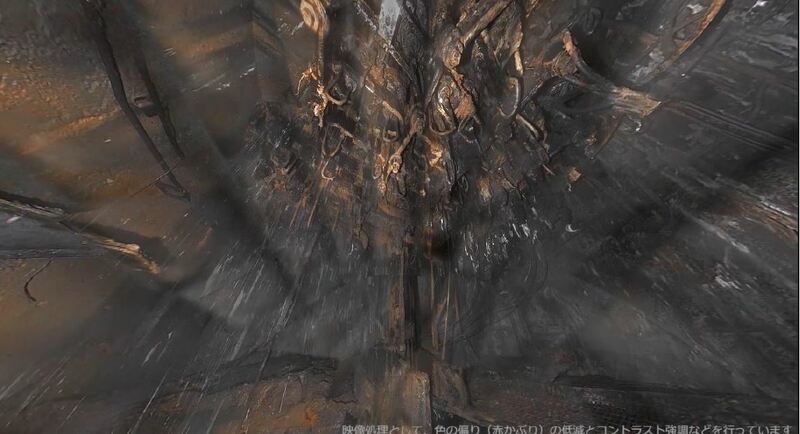 A pair of new panoramic photos from inside Fukushima unit 2’s containment have been published. TEPCO provided the photos as part of ongoing updates on the disaster decommissioning work. The photos were stitched together from earlier containment inspection work then processed to bring out details of the photos. 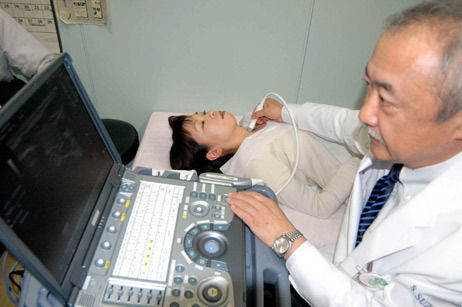 Also included in this report is details about the radiation and temperature readings inside containment, we explain that later in this report. The first photo shows the area directly below the reactor vessel by looking up from the upper pedestal location. The second photo shows with significant clarity, the conditions around the lower pedestal floor area. The photo above shows water drops falling on the left side. This is the same location where the catwalk floor grate was burned through. 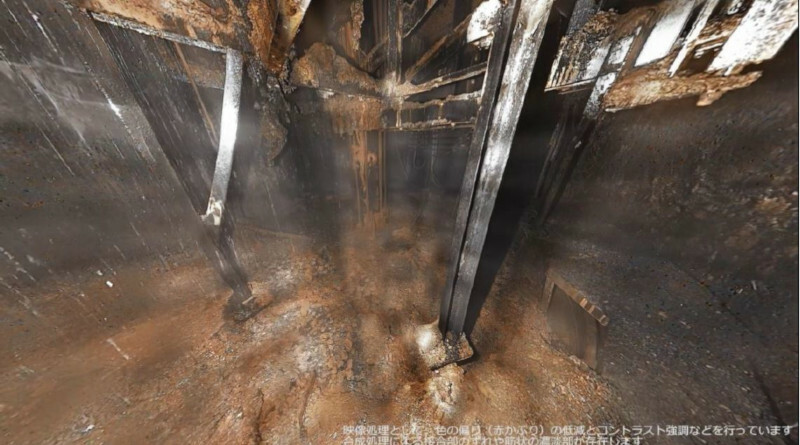 This is the assumed fall route where molten fuel escaped the reactor vessel and fell to the pedestal floor sump pit. The photo below shows the pedestal floor area with new detail not seen in prior photos. Fuel debris can be seen piled on the top side of various steel structural beams in the upper portion of the photo. The radiation levels in this are are lower than expected. This fuel debris is likely mostly metal from the reactor vessel and does not contain significant amounts of nuclear fuel. In the center back of the photo appears to be the pedestal doorway. To the right the charred pedestal wall and part of the raised cable tray can be seen. To the left water droplets falling from above can be seen. Fuel debris on the floor can be seen with a depth below the flanges of the support beams. The radiation levels near this fuel debris are quite low, indicating it is likely mostly metal and contains little nuclear fuel, at least at the surface levels. 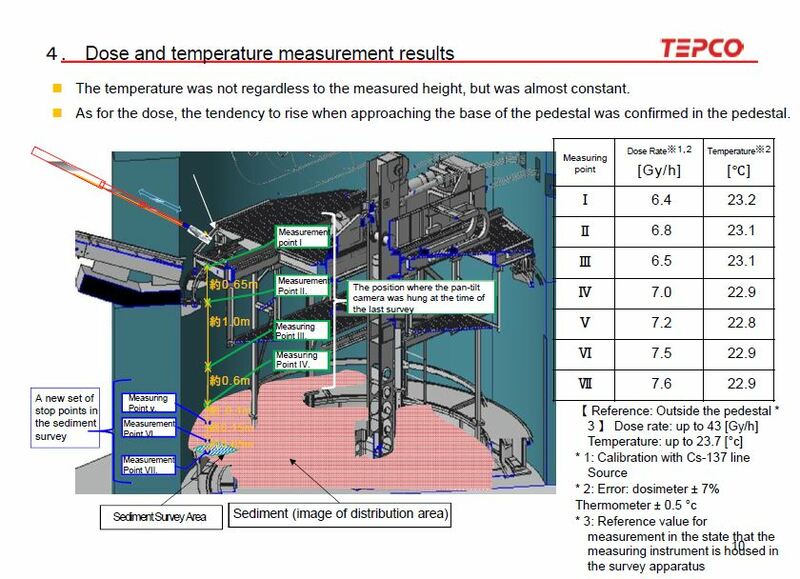 The slide below shows the radiation levels inside the pedestal and the temperature readings. Both are quite low. By contrast the readings along the CRD rail in outer containment as it passes near the recirculation pipe was 80 Gy/h. Upcoming work for unit 2 includes attempts to collect samples of the fuel debris for analysis. This should give a better idea of what is contained within the upper layers of fuel debris. This will help develop methods to remove the debris. It will also provide new clues towards understanding the events of the meltdowns. We will provide updates as this work takes place. Actual work dates have not been confirmed yet.